The belted half-coat crafted from the highest grade of New Zealand lambskin. It is the Godfather of butter-soft leathers and will keep you looking stylish and warm. Absolutely perfect to layer over a dressy blazer/suit. Or, simply zip-out the liner to wear multi-seasonally. This coat is designed for a comfortable, relaxed fit. 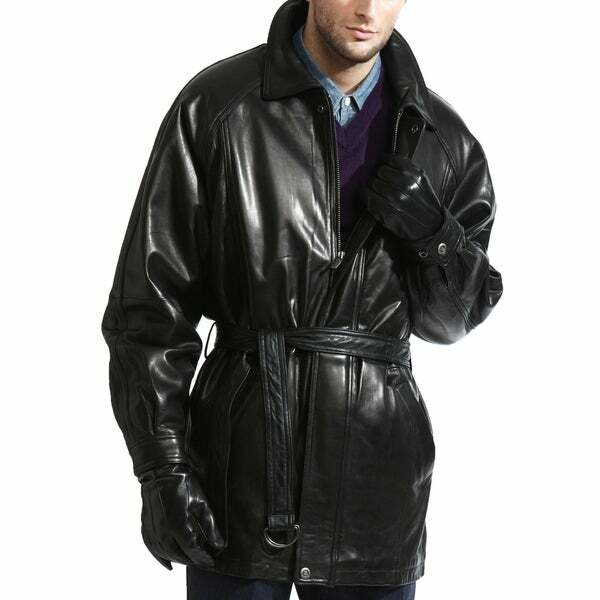 The front leather placket covers the front zipper and snaps on the cuffs keep the wind out. Two front pockets and an interior breast pocket to hold your essentials. The belt is removable. A classic that belongs in every distinguished gentleman's closet. Model in the photo is is 6'1, waist 32, wears 40R suit and is wearing size Small with the liner zipped inside and has plenty of room in the sleeves and throughout the body. A true relaxed fit.